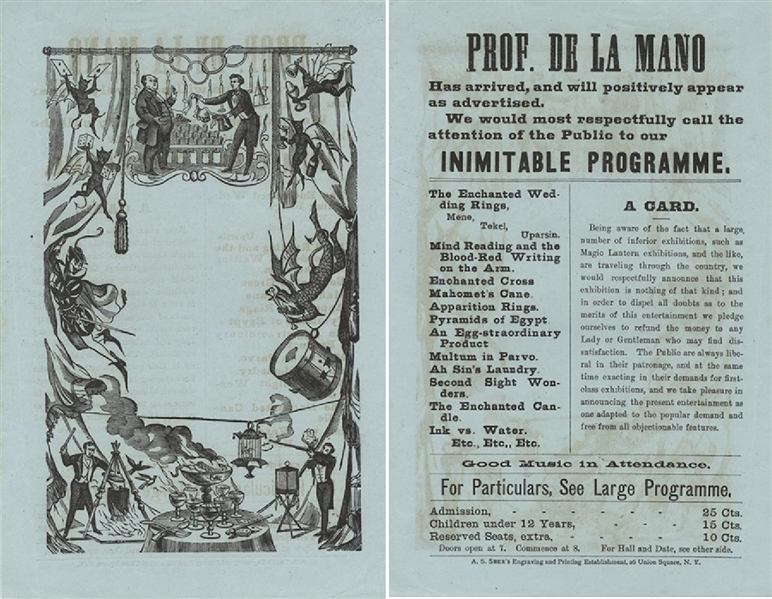 Printed Playbill, one page, 6" x 9", for Professor De La Mano (Zell Dreitzehn, 1830-1880). Proclaiming that he has "arrived and will positively appear". With a partial list of acts: Mind Reading; Enchanted Cross; Mohomet's Cross; Apparition Rings; Pyramids of Egypt etc. With the addition of a warning of disreputable, competing exhibitions and further advising that the show is "free from all objectionable features". The reverse features a wonderfully engraved vignette of the shows attractions. Very fine.